Book an economic private taxi from Malaga airport to Puerto Banus with our transfer services filling in the form on the left. Malaga Airport tu Banus: 58 km. Marbella to this Marina: 7 km. Time to reach Banus: 45 min. Public transport by bus offers a cheap way to get to the port. From the airport there’s a bus that will leave you in the city of Marbella where you can catch a second bus to Marina Banus in a journey that takes over an hour and 5 minutes, in the best of cases.We believe that you won’t find in this option what you’re looking for if you prefer the comfort, exempt of worries during your journey to the hotel. This is, undoubtedly, the most deficient option to get to the port. When walking out of the Terminal 3 you’ll find the airport’s station that will take you straight to Fuengirola on the suburban line; when you get there, you have to take a bus to Marbella and from Marbella another one to the port…so, you’ll need one train and two buses. 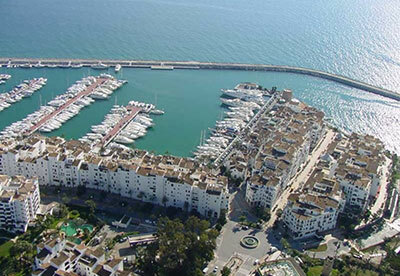 However, with our private taxis you can comfortably reach Puerto Banus in one trip straight from the airport. If you don’t mind driving around a city and a region that you may not know at all, the car rental is considered quite positive to travel around the different municipalities although depending on the area you may come across the inconvenience of not being able to find a parking spot, or in certain circumstances like going out at night you run a great risk if you end up having a few drinks. 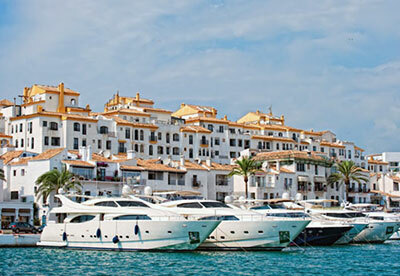 Due to its proximity to the city of Marbella, a visit to Banus is very tempting, highly recommendable, apart from for the obvious attraction of spectacular yachts, shops, boutiques and top quality bars and restaurants, you’ll also get the chance to enjoy a pleasant day in a port full of beautiful facilities. A place for leisure, shopping, good food and fantastic nightlife in ostentatious club parties. Go shopping in luxury boutiques and jewelry as: Versace, Gucci, Dior, Bvlgari, Dolce & Gavana, Loewe, Emporio Armani. Some of the best Marbella restaurants, here in Puerto Banus. 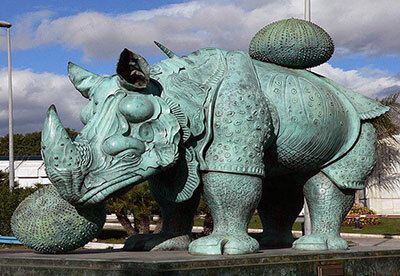 Rhinoceros of the artist Salvador Dalí: beautiful and spectacular sculpture. 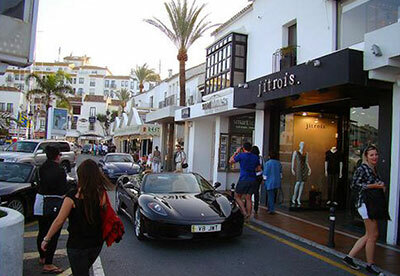 Boulevard de la Fama de Puerto Banús: tribute to great personalities who promote Marbella. Gran Marbella Cinema 3D, Corte Ingles Costa Marbella and leisure Centre Marina Banus. Flea Market Puerto Banus every Saturday. Play at Casino Marbella, located in this Area. Enjoy the nightlife in exclusive Bars, Discotheques and nightclubs like: Premier, Linekers, Old Joys, Pangea, Portside, Tibu, Seven, The Lounge.